Nearly two million people marched on Saturday in Pope Francis’ native Argentina to defend the life of the unborn and offer solutions to mothers in crisis pregnancies. Source: Crux. The rally was organised by Argentina’s March for Life, a lay-led organisation. Although Catholic bishops, evangelical pastors, and Jewish and Islamic leaders participated, they were not involved in the organisation of the event, which took place in more than 200 locations across the country. The other thing close to a political note of the rally was the presence, on stage in the country’s capital Buenos Aires, of a group of veterans from the 1980s Falklands War, the only armed conflict in Argentina’s recent history. 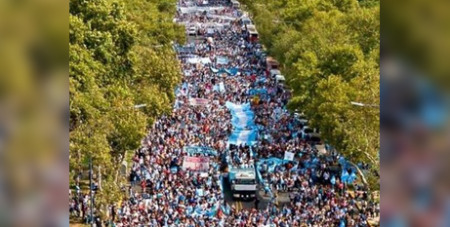 Buenos Aires drew the largest crowd, with more than 300,000 people marching across the capital. Aerial footage showed that at one point, the column of people was almost two kilometres long. The city of Buenos Aires is governed by Horacio Larreta, who belongs to the party of President Mauricio Macri, who last year allowed Congress to debate the legalisation of abortion for the first time in a decade.